The Maxim 2X2 Safety Goggles feature a versatile design for military and law enforcement. With a vented air seal to help minimize fogging, interchangeable temples and a broad elastic strap, these durable, lightweight safety goggles are a wise choice in tactical environments. Design helps protect from sun, wind, dust and flying debris and includes a black frame, broad elastic strap for a secure fit, flexible fit temples and a clear anti fog lens. Polycarbonate lens absorbs 99.9 percent ultraviolet protection. 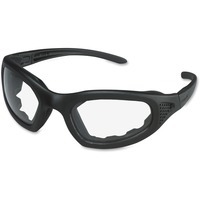 Goggles meet the High Impact requirements of ANSI Z87.1 2010.